This is issue number 49 of Naxos’ series containing Liszt’s complete piano music and what a treat it is. The CD is excellently programmed with a mix of some of Liszt’s most virtuosic music from the 1830s mixed in with works written half a century later. The CD works well as a single listening session mixing waltzes. polkas and a couple of galops in a most pleasing manner. 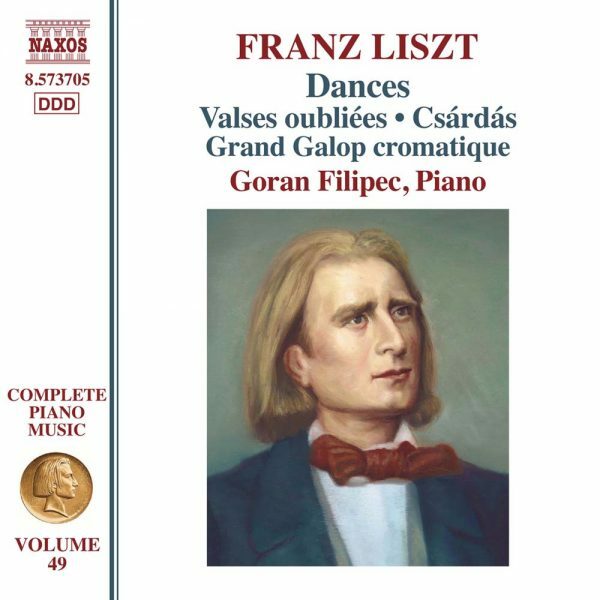 The Croatian concert pianist Goran Filipec is clearly a remarkable Lisztian. He has brilliant technique and plays these works most perfectly. The sonority of his Kawai grand piano has been captured remarkably well by the Naxos engineers and this must surely be one of the most successful volumes in this series to date. This CD would come highly recommended at any price; the fact that it is available at bargain price makes it unmissable and you really should seek out this disc. This is self-recommending as our bargain choice for August!